MakLoc Buildings is an industry leading producer of structural steel buildings; offering a full design build process and turnkey service. We support the functional shelter requirements and specifications of oil and gas, agriculture, commercial, heavy industry and government organizations. Working alongside engineering firms or directly with the customer, we offer unrivaled expertise and production capacity to meet even the most ambitious projects. With an experienced project management team using the latest technology, we combine the best of new and old to offer a complete custom structural design service for your project. 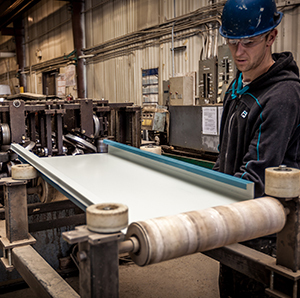 We have our own high capacity manufacturing space complete with fabrication shop and a fleet of transport and picker trucks to move products around Western Canada. MakLoc strives to be the number one choice for steel structure and building solutions. We are committed to safety and a positive work environment that fosters innovation, passion, a sense of family, and continuous improvement in all aspects of our business. Industry-leading safety and achieving a “zero incident” work environment for all of our employees and sub-contractors. Working collaboratively with our internal and external stakeholders to proactively identify problems and provide solutions for our clients’ unique requirements. Providing the highest level of service while maintaining industry-leading quality in all processes: business development, estimating, engineering and design, fabrication and welding, through to construction and final turnover. We recognized early that it takes more than just a great product to be successful; it requires a sincere consideration about how our clients benefit from what we do. Our buildings support production, they protect workers, protect the environment and stand the test of time. To be the best at metal buildings, we understand that service and quality are critical, and that requires the commitment of our entire team. We have a reputation for top quality and for doing what it takes to meet tight production timelines. From project management and production to field assembly and service, everyone at MakLoc is dedicated to upholding our position as an industry leader and creating long lasting relationships with our clients. We have a field safety record that is above the average, and that is a result of a passionate direction from management to protect our workers. More than just a business requirement, we believe that safety is critical to the quality of life our team experiences while working for MakLoc. Delivering the highest quality metal building products is a direct result of our amazing team, and we are building a culture of safety first to ensure protecting workers is always top of mind. Through years of growth and expansion, MakLoc built out the equipment and teams required to support the entire design build process. Clients come to us with a need and we will design a project that supports their goal, working with engineering firms or directly with the client to build a budget and timeline. With our own manufacturing center, fabrication capacity and transport teams, we deliver the complete service package. MakLoc Buildings is an industry leading producer of modular and stick-built metal buildings; offering a full design build process and turnkey service. We support the functional shelter requirements of oil and gas, agriculture, commercial, heavy industry and government organizations.